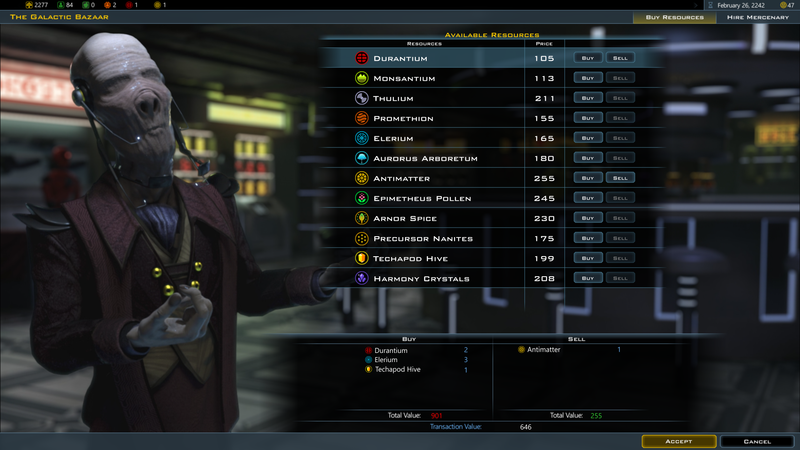 Now Announcing Galactic Civilizations III: Intrigue! 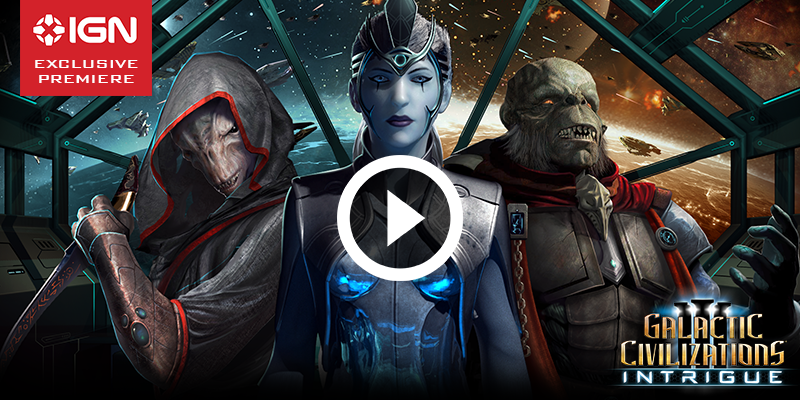 Establish a reign that starts on a single homeworld and expands across the galaxy. Billions of citizens. Thousands of light years. One strong leader: you. earn the trust and faith of your people in Intrigue! Not ready to pre-order? Add it to your Steam Wishlist. Bet you wish you'd paid more attention in your high school government classes! Each style of governing has its own advantages and disadvantages and affect the way you'll run your civilization. Your technology, species, and cultural ideology will determine what types of governments are available to choose from. 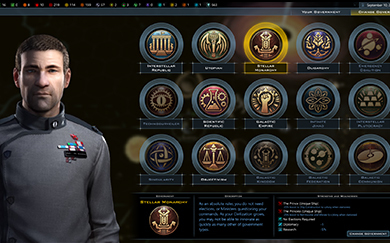 You'll also have the opportunity to appoint a cabinet comprised of your citizens to help customize your civilization and how it will operate. Some forms of government require elections, which means that you'll need to keep your populations happy in order to gain all the benefits and bonuses. Put your colonies on auto-pilot! 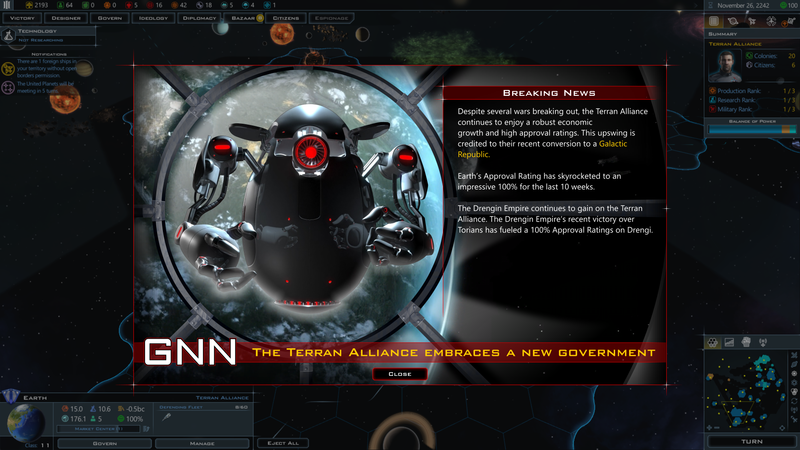 As your empire grows, worlds on the outskirts will want to become independent. By granting these worlds a status of commonwealth, they will be converted into an ally with a favorable disposition and will be inclined to implement your requests on the galactic scene. Thanks to the established AI, these civilizations will operate effectively without too much micromanagement or oversight required. There's always a good deal at the Bazaar! Well, maybe not always, but that’s what they’ll tell you, anyway. Previously, resources could only be obtained by trading with other civilizations, some of which might have been unwilling to make a deal. Now, you'll be able to purchase resources from a galactic market where the prices are determined completely by supply and demand. New technologies, planetary improvements, weapons, and more! Newer isn't always better, but in this case...it is. Awesome new ship modules and devastating weapons, unique planetary improvements, and technologies designed to improve your government are packed in Intrigue. All of these new additions will require galactic resources, which is what makes the Galactic Market so important! 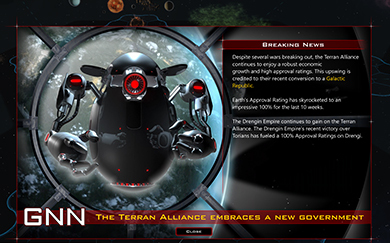 Keep up with current events using the Galactic News Network. In space, there is no biased reporting - that's because we've hired a robot to handle it! Check the news to monitor who's allying with who, who's declared war on each other, and many other activities that are going on across the galaxy. 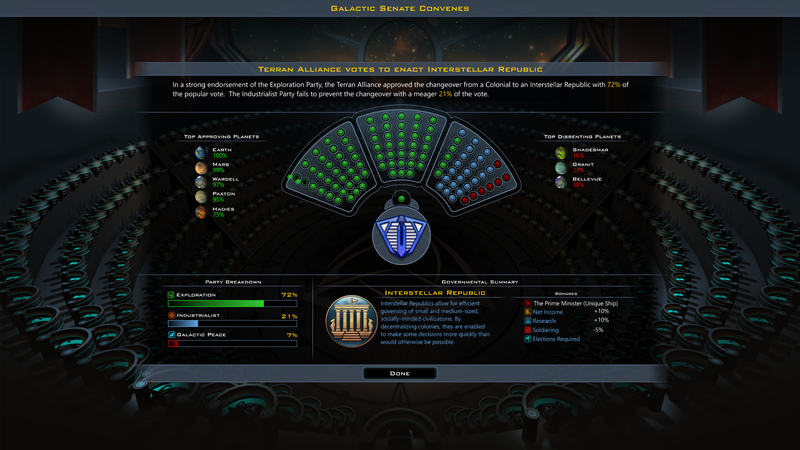 Galactic Civilizations III: Intrigue coming Spring 2018! Add it to your Steam Wishlist today. For more information, check out www.galciv3.com/intrigue. 4X strategy game. How will you rule your galaxy? I just want to know one thing: will this fix the gameplay problems with the biggest 3 or 4 map sizes? Because I'm getting tired of thinking I'm doing good before finding 3 or 4 nearby factions only to find out I'm somehow "Ripe for Conquest" despite building ships and garrisons. Then I end up with factions nowhere near me declaring war for no reason because they can't get to me and vise versa. Use to be able to slow them down with pirates, until their generation got nerfed due to system resource issues. 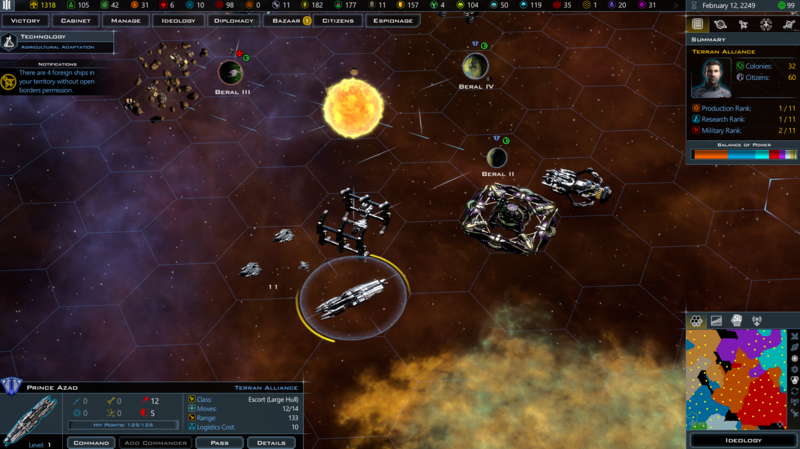 At this point I'm just frustrated - bought it at launch and every DLC because I do like Stardock, I'm a big GalCiv2 fan, and there are things I like about this game - but too much of the gameplay seems to be "find the exploit, repeat" which isn't strategy. I believe one of the trends we are seeing in 4X... and I'm wholly on board with... is less focus on "winning" at any cost, and a little more focus on immersion and even roleplaying our empires. So an alignment system based on behavior makes a ton of sense to me, if one is embracing that trend. GC3 has a big leg up on this trend, in that it allows one to heavily customize their race and its appearance/ships/etc. Hopefully government will really help shore up these bits... if we are VERY lucky, there will be some direct interaction and unique diplomatic and ideological features related to it. I think you raise a good point though, that playstyle can't be too constrained by alignment... on the other hand... maybe the reality is, that if you declare war moderately and want a free hand politically... you are a moderate and NOT benevolent. Maybe the player just needs to be OK with that. You want to be a goody-tushu... well... act like one. Maybe the reason history doesn't have that many "benevolent" examples of nations and states... is because its just not very practical... maybe the moderates should be the vast majority of players. But I digress! It really comes down to your goal with the game... is it a competition to win, or an immersive experience? Its could be both... but are we happy with the current balance between these two? I agree that such immersion would be a good thing, but to make it work, you'd almost have to build the game around it, and I'd say it's a bit too late for that with GC3. Although, this can maybe be done a bit less directly. 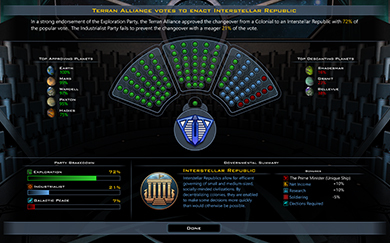 Say, maybe Benevolent doesn't lose points for declaring war and such, but gets an invasion penalty, and a temporary moral loss upon declarations of war (Strategic benevolent players will simply provoke other civs, but will have to do so by means other than sending warships into enemy territory to avoid the moral loss). They get 2X the planetary defense boost, though, to make the alignment more desirable(wars can't be won defensively, so it'd almost have to be boosted by double). Malevolent, rather than being the inverse, has a different problem. They may not have to conquer to win, but can face revolts for playing too defensively while in the midst of a war, they'll get a warning before it starts happening, and has to be more than 50-60% of the fights happening in their space(and not near any borders) and their planets before they are at risk, but they still have make sure to be somewhat agressive, lest they lose planets to a new civ that is instantly at war with them. Pragmatic, naturally faces no penalty for any playstyle, at least not domestically. Being neutral during wars can carry its own diplomatic risks if you're already seen as a pragmatist. They may not get war declared on them for this alone, but it becomes more likely to happen, especially if they trade with civs on both sides of the conflict. So it can still be done, at least sort of, without constraining player choices. Not on the level of a game built around it, but enough to add flavor and complexity. Yeah, kinda weird that this only happens upon colonization. A simple idea for how to do this would just be to make it so that that these random events can trigger for already colonized planets, including the home planet, but with the stat boosting events being limited to the first 5 events for a given planet (7 if a home planet), and having diminishing returns. After that, only the ones that award BC and stuff can trigger. And of course, only one event per turn. This would be a simple way to do it, as it wouldn't require a whole list of new events. I'd like more random events; but I had a more radical solution in mind. I think that ideology should be tied into influence generation as culture is tied into civic perks in Civ 5. 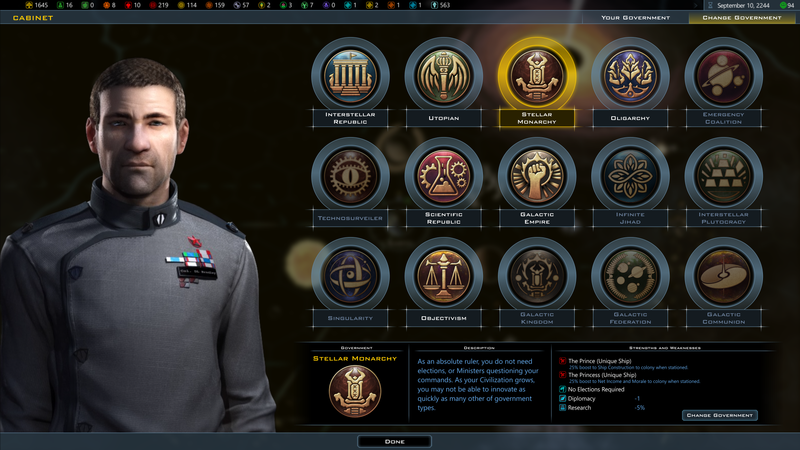 So you get Neutral ideology points from your influence generation buildings that you can spend on any branch and then those are supplemented by the benevolent, pragmatic or malevolent points that you get from colonization events and the improvements (So if you have 10 benevolent points, and 30 pragmatic points and 50 neutral points you'd have 60 points for Benevolent, 80 points for pragmatic and 50 for malevolent....until you spend them.). If ideology got fleshed out properly it could even be expanded to give us a larger tree. By the same token I think approval should tie into citizen generation in the same way that happiness ties into great people generation in CIV5. Just giving me a citizen every ten turns feels arbitrary, if my people are super happy then maybe I should get one every 5 turns and if they're really depressed maybe I should get one every 20 turns. I'd also like to see the ability to manufacture citizens with industry expanded with a corresponding building for every citizen type. I like the idea of retooling influence, while we're at it, it'd be REAL nice if allies were immune to being culture flipped by other allies. The idea sounds good except the part where you choose. I still think it would be better if we add up all the points. Then average what your choices are. I like the idea if you dont colonize a planet after so many turns a random colonization event is triggured on a random planet. I think if not colonizing then you should get the ideology points, but not the benefits for the colony that has already been colonized. Will you display resource price history chart in the galactic market? So that we may remember the story of one or another resource and make our game experience more interesting? We could even make some notes in those charts if we wanted to, for our own knowledge. Yeah, kinda weird that this only happens upon colonization. 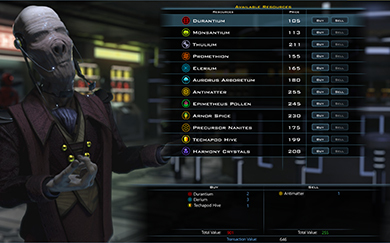 Anomalies could be altered to provide a space based ideology choice. This would add another lever.